“It feels like a cotton ball just exploded in my mouth,” says a tenth grade boy, looking pleased. 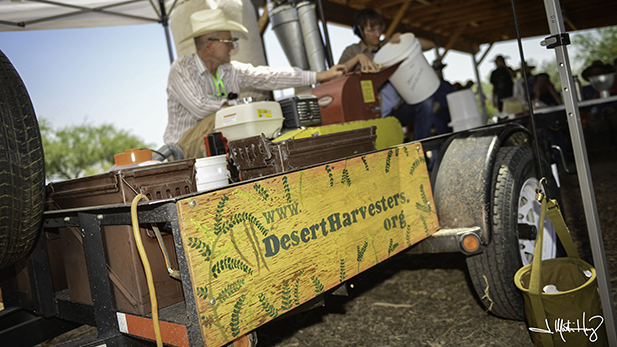 The Desert Harvesters take their hammermill to neighborhoods and festivals. The dried mesquite pods go in the hopper and come out the other end as flour. He takes the group to a few more trees to sample the pods. He points out that some trees grow pods in bunches, which means they’re easy to harvest by the handful. Not only are wild, native foods free, but they are nutritious. Cholla cactus buds, prickly pear fruit, wild spinach, chia seeds and mesquite flour help regulate blood sugar. Lancaster says there’s also an economic opportunity here. More and more restaurants in Tucson want to put local, native foods in their menus. “But we don’t have the harvested supply to meet the growing demand,” says Lancaster. It’s free food growing on a tree that doesn’t need irrigation. On the other side of Las Milpitas, Desert Harvester volunteers are running the grain mill. It’s loud. Most people don’t just munch on whole mesquite pods; they turn it into flour and cook with it. Lancaster gives the City High kids a sample to taste. He reminds them that the flour flavor will differ depending on the tree they picked from. The mill is mounted on a trailer so Desert Harvesters can take it around to neighborhoods and farmers markets during harvest time. The group tries to make it easy for people to turn their pods into flour and take advantage of this free food. But Lancaster says most people don’t know what to cook with mesquite. Even he didn’t have much of a mesquite flour repertoire. “We’d just been makin’ pancakes!” he says. 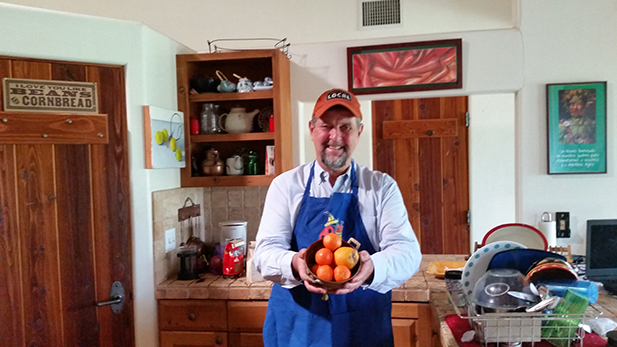 So Desert Harvesters asked people for recipes and put together the Eat Mesquite cookbook. Lancaster literally wrote the book on rainwater harvesting. It’s called Rainwater Harvesting for Drylands and Beyond. Rainwater harvesting is simply techniques to collect, store and use rainwater. At his house in the Dunbar/Spring neighborhood, the land between people’s property lines and the street was bare dirt. Lancaster and his neighbors dug basins and planted natives like chollas and mesquites in those basins. Then they made cuts in the curb. Now, when it rains, the storm water rushes down the street and goes right into those basins, and fills them up. 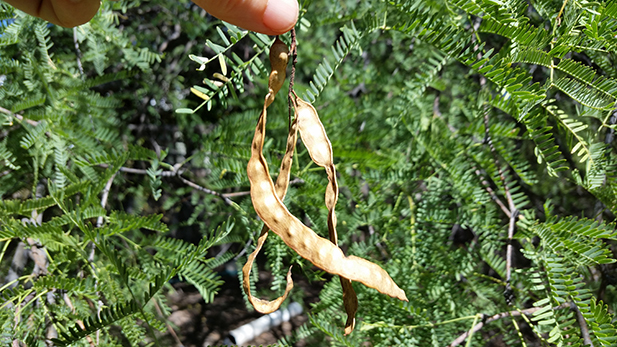 The pods from every mesquite tree have different flavors. Brad Lancaster recommends tasting before you pick. He says some can be “heinous,” while others can be as sweet as candy. 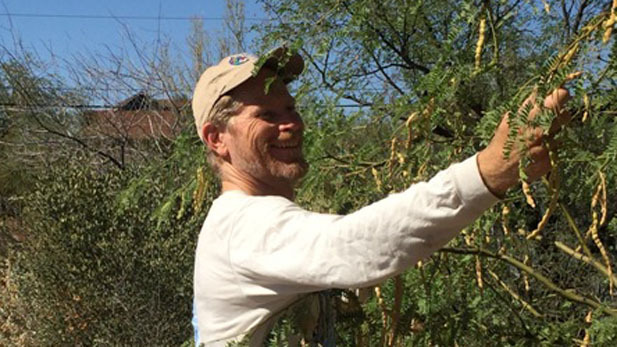 “It had gone from this completely denuded walkway to this beautiful canopy that was cool and you could have native fruits being produced whether it was cholla buds or the mesquite pods,” says Leslie Ethen. She is Sustainability Manager for the City of Tucson, in the Office of Integrated Planning. What will happen to native plants when our region heats up? The University of Arizona’s Climate Assessment for the Southwest (CLIMAS) predicts a 10-percent drop in annual precipitation in the next decade, and a later start to the monsoon rains. More bad news from CLIMAS: the temperature is predicted to be a lot hotter, with more days that break 110 degrees. Is local food production the best investment of our water? A Saudi company had that same idea. In January 2016, Almarai bought 14,000 acres of farmland between Gila Bend, Arizona and Blythe, California. They’re growing alfalfa, and shipping it back to Saudi Arabia to feed dairy cows. Alfalfa needs a lot of water. 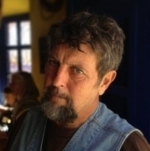 Gary Nabhan is Director of the Center for Regional Food Studies at the University of Arizona. He is a strong advocate for supporting our local food system. “They are saying that they are protecting their capacity for future self-sufficiency by not pumping their groundwater and getting their alfalfa from someplace else,” says Gary Nabhan, director of the Center for Regional Food Studies at the University of Arizona. Right now, 98 percent of our food comes from outside our region . . . There’s something like a three-or-four-day supply of food in the community at one time. And what happens if the people of Mexico and California start to ask the same question about their water being exported to Arizona in the form of tomatoes and all the other food the supply us with in Southern Arizona? Nabhan says we need to be prepared for these conversations, and we need to strengthen our local food system. Right now, 98 percent of our food comes from outside our region, according to Leslie Ethen. She says Tucson Water is preparing for the future by banking around six months of water supply from the Central Arizona Water Project (CAP) each year. But when it comes to food, we don’t even have a one-week’s supply. 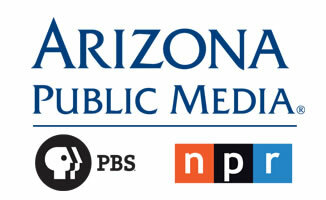 Leslie Ethen says climate change probably won’t hit Arizona as a single, catastrophic event like a Hurricane Katrina. It’ll be more like death by a thousand cuts – on an endless summer of 116-degree days and no rain on the horizon. But Ethen believes we still have time to get ready.